The farthest I've ever traveled by boat was when I took a ferry from Italy to Greece. It was and overnight trip, and we left Italy in the mid-afternoon and arrived in Greece mid-morning the next day. I tend to be nervous on boats (I get seasick), but it was a remarkably smooth ride, and mostly I just couldn't believe how big the ferry was. I'm not sure how many passengers it carried, but it was big. It was actually pretty shocking to realize that it was nowhere near the size of the cruise ships we used to see towering over the buildings in Saint Lucia. How either of these boats compare to the size of the steamers that traveled between Sri Lanka and England in the 1950s, I'm not sure, but it's easy to believe that they would have been big enough to entertain an 11-year-old boy. 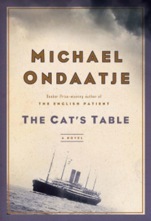 On the surface, that's what Michael Ondaatje's new novel The Cat's Table is about: a boy on a ship, and everything he gets up to. It's amazing the way a three-week period can completely alter the course of someone's life. In this case, the journey from Colombo, Sri Lanka, the only home our narrator has ever known, to England, where he will reunite with his mother, takes 21 days. Although he has a "guardian" in first class and discovers his cousin Emily is also on board, Mynah (whose real name is Michael) is mostly on his own. He is seated at the Cat's Table, which is described as the least desirable table in the dining room because it is the furthest from the captain, but it is populated by an assortment of interesting people who add just enough intrigue and adventure to the journey to keep Mynah from becoming too bored. Two of his table-mates are boys his age, and although they're initially shy, soon he and Ramidhin and Cassius are fast friends. The novel is told in retrospect, so although the story is mostly chronological, it moves around a little because memories don't always connect in a linear way. For example, we meet all the important players in the story fairly quickly, even though in real time it seems that Mynah wouldn't have met certain people, or known details of others' lives until later in the journey. Memory works in a weird way, and The Cat's Table unfolds in a natural way, as though the adult Michael is only now properly considering how his life was affected by those three weeks at sea. For the first half of The Cat's Table, for example, very little is said about the narrator's adult life. The entire focus of the piece is on the journey, and he details what he and Cassius and Ramidhin did to pass their days. They got up early in the morning to watch an Australian woman roller blade around the deck, they swam in the pool, they ate all the emergency chocolate bars from the lifeboat caches. And, after dark, they hid out so they could watch the mysterious prisoner come out on deck to walk around and have some fresh air. The prisoner is a key part of the story, but the plot doesn't build him up as such, and for much of the first half of the novel he's merely a curiosity – just another part of the strangeness of the ship. In a lot of ways, the structure of the narrative matches that of the voyage. For much of their time at sea, the ship is in open water. Everything seems vast and open, but once they reach the Red Sea and land is in sight, the mood changes. On the ship, people become more tense, and in the story, the narrator becomes more thoughtful and the story moves away from the voyage to his life afterwards, as if the nearness of the land gives him permission to look beyond the journey: from all the possibilities inherent in a trip to somewhere unknown to the reality of what happened. There's an author's note at the end of The Cat's Table explaining that although Ondaatje also traveled by ship from Sri Lanka to England at the age of 11, this is not an autobiographical novel. I found it distracting, though, that the main character's name was Michael, and that later in life he too had become a writer. It wasn't distracting enough to take away from the novel, though. Rather, I think having that question firmly in the back of my mind while reading made me pay closer attention – the way you do when an elderly relative tells you a story of when they were young and you listen for any details that tie their younger self to the version you know. I don't know Ondaatje, but reading about a man searching for details about himself by revisiting his past is a surprisingly riveting experience, and as much as I was wound up with the story of the boy on the ship, it's the older narrator who has stuck with me. I like what you've said here about the shape of the novel reflecting some of the qualities of a sea voyage. I enjoyed it too, despite being uncertain at the outset. 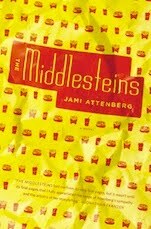 I've also found myself thinking about the characters quite a bit since I finished it, which has really surprised me.